ESTE PRODUCTO REQUIERE EL JUEGO BASE Strategy & Tactics: The Wargame Collection. 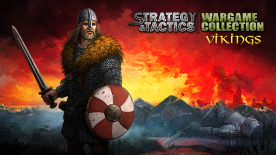 This DLC for Strategy & Tactics: Wargame Collection offers the heroic ambiance of the Viking Age. These fierce warriors used to terrify all of Europe! Wind fills the sails of their drakkars - it is time to stain the swords with blood in praise of the northern gods! In addition to a big story campaign focusing on the deeds of the Vikings, there are a lot of single-player scenarios. Obtain unfading fame in the legendary battle of Brávellir, unite the Norwegian lands, conquer England, and go on to wreak havoc in the Christian kingdoms of Europe! Lead the Dutch or the Pechenegs in their violent raids - or protect your borders in the name of England, France, the Holy Roman Empire, or Rus'.